Yeast and/or bacterial infections in dog ear are rather common. Many conventional medications for recurrent chronic ear infections include strong drugs such as antibiotics, anti-fungal medicines, antihistamines, and steroids. As in many other infections, chronic ear infections in dogs are largely due to an immune system that is weakened or out-of-sync. Prolonged use of antibiotics and steroids cannot address the root cause. In fact, it can aggravate the problem since prolonged use of these medicines can very often wreak havoc to a dog's immune system. 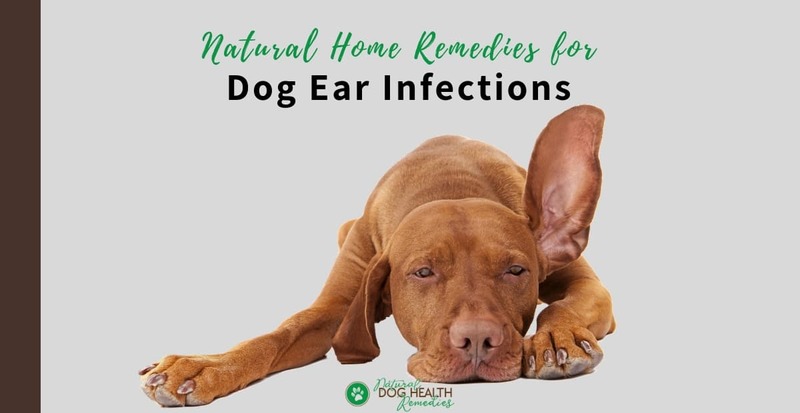 If your dog is prone to ear infections, try a natural approach. Steep two green tea bags in boiling water for about 15 minutes. Let the tea cool down and use it to flush the ears twice a day. A 1:1 mix of vinegar (organic apple cider vinegar or white vinegar) and water can also be used to flush the ears regularly (once or twice monthly) to keep your pet's ears clean and bug free. Note, however, that if your dog's ears are inflamed, the vinegar stings and can cause pain to the dog. Add 4-10 drops of GSE with ½ oz of 100% pure aloe vera juice or witch hazel. Use it to clean the ears 2-3 times a day. Calendula has antifungal properties. It is also extremely effective in promoting wound healing. One way to use calendula is to make an ear wash. Get a tincture of calendula. Add a teaspoon of the tincture together with 1/2 teaspoon of sea salt to a cup of distilled or filtered water. Use the mixture to flush the affected ear once or twice a day. The strong antibiotic and antibacterial properties of Oregon grape make it an effective herb for treating ear infections or ear mites. Use an oil infusion of the herb. Wipe the infected ear once or twice a day until the infection is gone. Oil of oregano has extremely powerful antibacterial properties. It is very potent so be sure to dilute it before using on your dog. I like to add 2 drops of oil of oregano to 30 ml of either 100% pure aloe vera juice, or the hydrosol of Tea Tree (not Tea Tree oil). I then soak several cotton balls with the oil blend and use them to clean my dog's ears. According to G. Tilford (author of Herbs for Pets), the flowering tops of mullein have antimicrobial properties "with a special affinity toward infections of the ears." The simplest way to use this herb is to get an oil infusion. You can apply a few drops of the infusion into your dog's ears, and use some cotton balls to clean out all the gunk inside. Ear Care Gold Dog Ear Infections: This herbal ear drop works to soothe itching and irritation and boost the immune system. It can also help prevent recurring ear infections. It contains herbs such as mullein, calendula, st. john's wort, aloe vera, and olive leaf. Halo Cloud Nine Herbal Ear Wash for Dogs : This product contains useful oil and herb extracts such as St.-John's Wort, Sage, and Chamomile, and is a good ear wash for dogs! As mentioned above, chronic ear infections are an indication of a weakened immune system. If your dog has been repeatedly treated with antibiotics for ear infections, chances are his immune system is largely compromised. Furthermore, since antibiotics also kill off the "friendly" bacteria in the dog's digestive system, your dog will also suffer from various digestive problems. 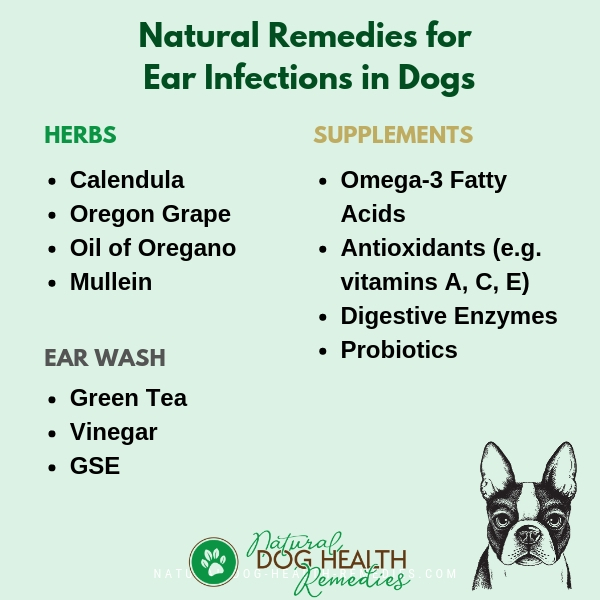 Natural dietary supplements, such as digestive enzymes, antioxidants, probiotics, and essential fatty acids, are the basic essentials for treating chronic dog ear infections from the inside out. Essential Omega-3 fatty acids should be given to your dog as a daily supplement, not only for general health management, but especially for boosting the immune system and controlling inflammation. Antioxidants can help reduce free radical damage to cells, which has been implicated in a wide array of serious health issues, such as ear infections. Vitamins A, C and E are good antioxidants. Digestive enzymes can help the body digest and absorb food better. Better digestion can also help keep inflammatory processes in check. Probiotics replenish the body with the "good-guy bacteria" and are absolutely essential for dogs who are being or have been treated with antibiotics or any other prescription drugs that kill off and upset the balance of intestinal microflora. Integrative Therapeutics - Phytostan : Very often, dog ear infections (especially chronic ear infections) are caused by an overgrowth of the fungus Candida albicans. This Phytostan supplement is an excellent natural antifungal formula that combines Caprylic acid, Undecyclenic acid, and grapefruit extract with Pau d'arco and extracts of other key antifungal herbs such as rosemary and thyme. Only Natural Pet Ultimate Daily Canine Vitamins Plus : This dietary supplement contains flaxseed (rich source of EFAs), digestive enzymes, vitamins, and antioxidants. Only Natural Pet Probiotic Blend Soft Chews : This probiotic blend supplies the essential "friendly" bacteria to guard and support the digestive system of your dog. Find out the symptoms and causes of ear infections in dogs here.